Author's Note: This article is part of RTV6's 2017 mid-year crime update. 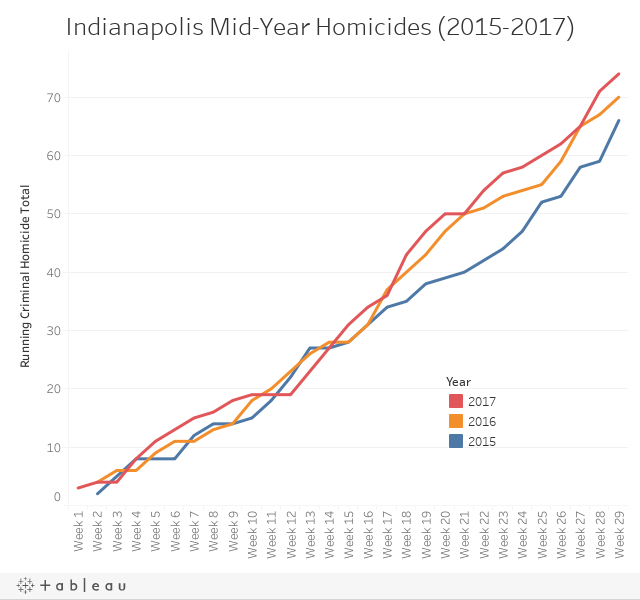 For a more nuts-and-bolts look at Indianapolis crime in the first six months of the year, scroll to the bottom. INDIANAPOLIS – Why is the .40-caliber pistol – for years waning in popularity among gun owners – suddenly seeing a surge in use as a crime gun in Indianapolis? Gun trace data from IMPD covering 2013-2016 and the first six months of 2017 show traces of .40-caliber crime guns rose by 43 percent between 2013 and 2016. Overall gun traces were erratic for that period, but on the whole saw an increase of just 5.6 percent. The .40-caliber also saw its slice of the overall crime gun pie grow during that period, rising from just under 12 percent of all guns traced in 2013 to nearly 17 percent in 2016. By comparison, the .22-caliber, which had nearly identical numbers as the .40-caliber in 2013 and 2014, saw traces remain basically flat – dropping from 376 in 2013 (12.35 percent) to 333 traces in 2016 (10.35 percent). But if the .40-caliber is gaining popularity on the streets of Indianapolis, it’s not because more people are buying them, according to an Indy firearms dealer who says he has largely stopped stocking them. A lot of that comes down to price. The 9mm cartridge is cheap and easy to come by. RTV6 found 1,000 rounds of 9mm ammo for sale on a bulk online retailer for $164. By comparison, 1,000 rounds of .40-caliber ammo from the same manufacturer would run you $230. The sheer abundance of 9mm handguns has kept them on top as Indy’s favored crime gun caliber. IMPD traced 625 9mms in 2013, about 20 percent of its overall traces that year. That rose to 837 traces of 9mms last year, comprising 26 percent of all guns traced. The 9mm is also the gun most often involved in murders in the city. Out of 149 murders last year, IMPD released weapon information about 119. Of those, the 9mm handgun was listed as the murder weapon in 48. The only gun that comes close to matching the 9mm’s role in Indianapolis homicides is the .40-caliber. Out of those same 119 homicides last year, 26 involved a .40-caliber pistol, according to IMPD. The next closest gun is the .22-caliber pistol at nine. That, at least, was not surprising to the firearm dealer, who said the .40-caliber has maintained a lasting image thanks to its role in pop culture. But since people rarely do come asking for .40-calibers these days, he has a different theory for their sudden popularity on the streets: They’re stolen guns. “People are targeting them because the .40 caliber is so popular with a certain crowd,” he said. RTV6 took an in-depth look at the problem of stolen guns in Indianapolis in April. Click the image above to see what we found. That might be why, although 9mms win on overall numbers, the .40-caliber Glock was the single-most-traced crime gun in Indianapolis over the entire period RTV6 examined. In 2015, IMPD traced 140 .40-caliber Glocks. In 2016 the department traced 203. So far this year, IMPD has traced 88 of them. Glocks also offer larger standard magazines than other popular guns (the Glock 22 carried by IMPD officers, for instance, has a standard 15-round magazine), and is easy to upgrade to a high-capacity magazine. All that being said, if you’re wondering if more .40-caliber guns has contributed to Indy’s rising homicide rate – experts say that’s unlikely. While the .40-caliber bullet is larger and heavier than the 9mm, the difference isn’t significant enough to drastically affect a bullet’s lethality. More relevant to that are shot placement and the time it takes a shooting victim to receive emergency care. 2015 ended as the deadliest year in Indianapolis history, only to quickly lose that title to 2016, which saw 149 murders in the city. Despite a 20-day stretch without any criminal homicides in March, 2017 entered July at 61 criminal homicides – just one behind 2016’s six-month total of 59 – thanks to a bloody 16-day stretch in late April and early May that saw 14 people murdered. The second-half of the year has tended to be more violent in recent years, with 2015 marking 91 murders between July 1 – December 31, compared to 53 during the first six months of the year. The pattern repeated in 2016, with 62 murders during the first six months of the year, followed by 87 in the second six months. 2017 looks to be continuing that trend, with 13 suspected criminal homicides in the first 16 days of July – bringing 2017’s year-to-date total above 2016’s. By contrast, the department nearly made it through the first six months of 2017 without a single fatal officer-involved shooting. As of this writing, the fatal shooting of 45-year-old Aaron Bailey remains IMPD’s only fatal officer-involved shooting in 2017. The circumstances of the shooting have sparked weeks of protest and promises by IMPD and Mayor Joe Hogsett to implement implicit bias training and changes to the department’s use-of-force policy. While 2016 ended as the city’s deadliest year in history, it did so with only four murder victims under the age of 18 for the whole year (three other juveniles were killed in shootings deemed accidental or self-defense). By comparison, 2015 ended with 11 murder victims under the age of 18. At the mid-year point, 2017 will already not follow in 2016’s footsteps. As of July 1, six people under the age of 18 have been murdered in Indianapolis. Another three juvenile victims have been killed in shootings deemed accidental. Although it’s had seemingly little effect on the city’s homicide rate, non-fatal shootings saw a 21-percent drop year-to-date compared to previous years. By July 1, 2015, IMPD had reported 240 non-fatal shootings. As of July 1, 2017, IMPD reports that number is 190 for the year.